Class III milk prices for April were announced on May 4. It is rare to have no change in price from the prior month. 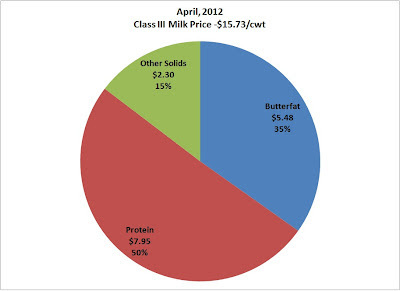 However, the April Class III milk price was exactly the same as the prior month - $15.72/cwt. The new prices were announced in the new extended format. Although there was no price change for Class III milk, there was a movement in the factors that make up the components of the Class III milk price. Fortunately, those parameters that were down were the least important ones that influence only the price of "other solids." 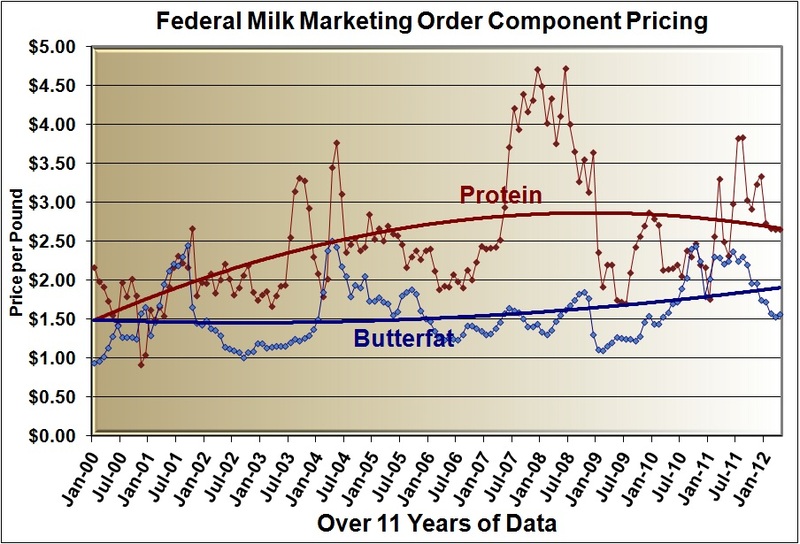 "Other solids" pricing has a minor influence on the Class III milk price. Cheese and butter prices were up slightly, offsetting the negative impact of "other solids." Cheese and butter prices were up slightly. As a result, protein was unchanged, butterfat was up slightly, and other solids as noted above were down. This created a very classic pie chart of the milk check with 50% of the money coming from protein. 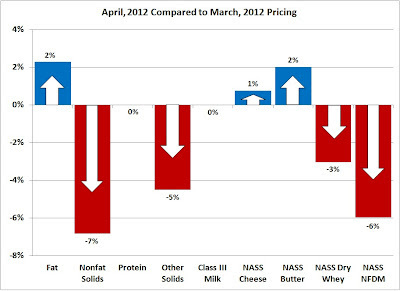 The April prices for butterfat and protein were very stable compared to the prior two months. In last month's post, they were described as "normal," so the same would be true for April. Being normal at a time of high feed costs may not be adequate for profitability. 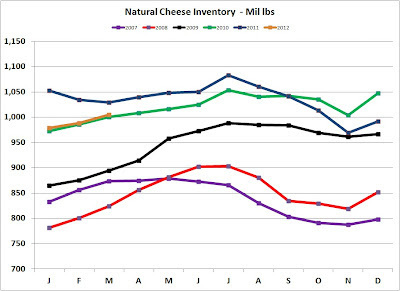 Cheese prices really dominate the Class III milk price. 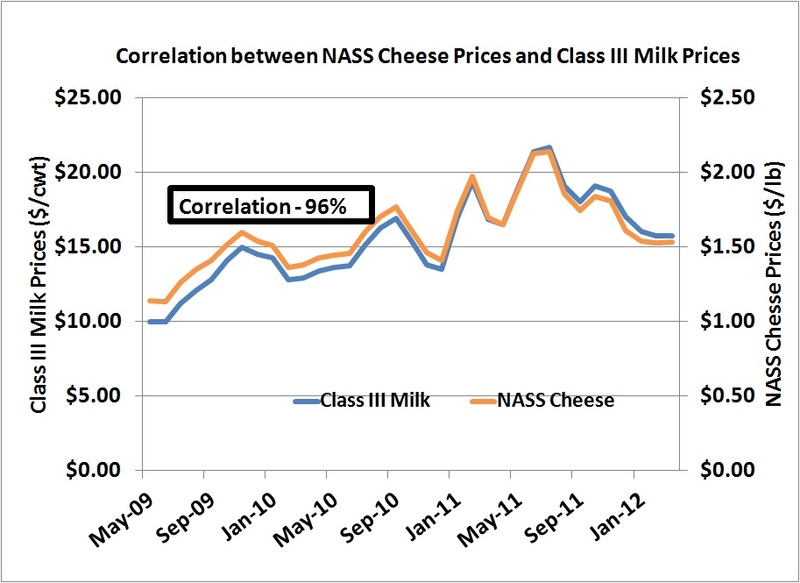 When compared over the last three years, there is a 96% correlation between the NASS cheese price and the Class III milk price. This is driven by the formulas as analyzed in a prior post to this blog. 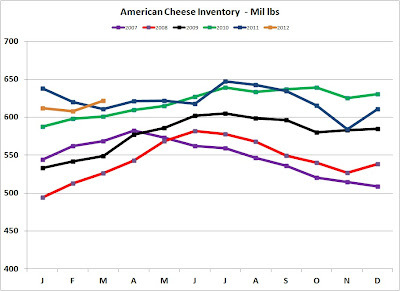 Cheese inventories are not in bad shape. 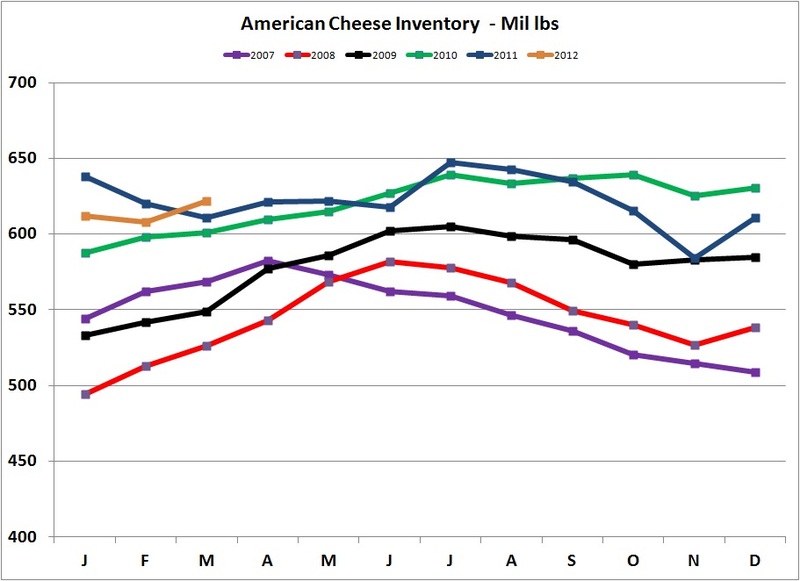 Both Natural and American cheese inventories are perhaps slightly high, but not badly out of line. Cheese exports are available only through April, but so far the exports are stable, although not growing as would be hoped. With the USD slightly strong to the Euro and the New Zealand dollar, exports could be much worse. It would appear that some of the strong export programs in place are having a positive impact by at least maintaining export levels. 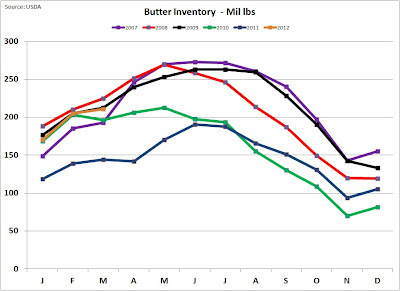 Butter inventories have totally recovered from their very low 2011 levels and appear to be maintaining a normal level month to month. 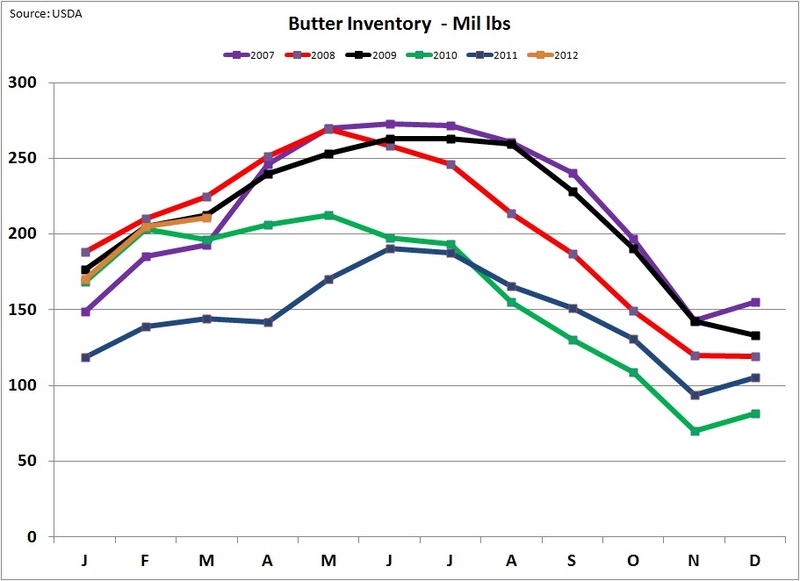 As a result, butterfat prices have also remained stable. 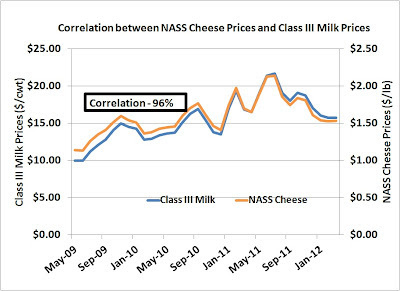 The Class III milk price is very dependent on the NASS cheese price. 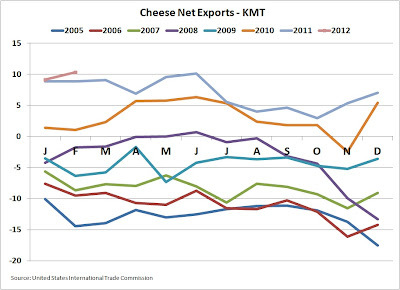 The cheese price is very dependent on exports. Exports are very dependent on exchange rates. A weak USD favor exports and a strong USD make U.S. cheese too expensive for the export markets. The USD seems to be strengthening against the New Zealand Dollar and there is risk to the financial stability of the Euro which could also strengthen the USD against the Euro. If the dollar strengthens, exports will be more difficult, and milk prices will weaken. 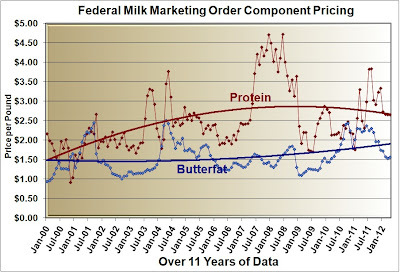 However, the more likely scenario is that milk prices will remain stable around the $16/cwt price for the remainder of 2012.